I was drove down to Singapore alone. As usual it was quite a smooth drive down and had no jam until I reach the Singapore side. I am always amaze by how they search our car and the things they made us do. The last few trips I went down was OK. Not too many searching in car just open the boot and that it. I dont why they doing this search and what they looking for. But I notice that there were a few cars they wanted to do a 100% search. They actually ask the car to move to one side and they search. Make me wonder... why do all this hassle... then I realise that it is because they have national service and most of the people do the searching was young guys so probably as part of the training they post the people there. 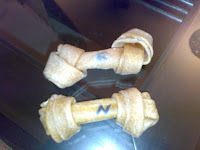 Back to the story... My cousin Patrick has 2 dogs. Nick and Sam... I must say they are cute dog esp Sam. I told Patrick "Boy you sure think very highly of your dog". The reason why I said that. Would you buy Books for him ? My cousin, Ah Ling told me that on Sat morning she came downstairs and my uncle told her that there is someone setup stall selling books in front of the house. My cousin was thinking wah.. now times are bad people really have to setup stall in front of the house. My uncle told her her go and check out the stall. When she went out.... To she didn't know whether to laugh or to scold. For those of you who dont know, that is my cousin son Andrew. Her own son is the one who setup stall selling books. 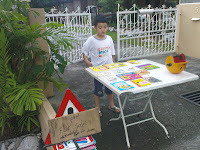 He setup stall in front of the house selling the books. He made a sign and everything and he was shouting for ppl to come buy. If you look closer at the pic you will see the sign. The problem is that he price his book very expensive. You can see if you enlarge the pic.